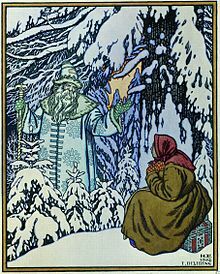 Morozko (Russian: Морозко, Morozko) is a Russian fairy tale collected by Alexander Afanasyev in Narodnye russkie skazki (1855-63). Andrew Lang included it, as "The Story of King Frost", in The Yellow Fairy Book (1894). It is Aarne–Thompson type 480, The Kind and the Unkind Girls. Others of this type include Shita-kiri Suzume, Diamonds and Toads, Mother Hulda, The Three Heads in the Well, The Three Little Men in the Wood, The Enchanted Wreath, The Old Witch, and The Two Caskets. Literary variants include The Three Fairies and Aurore and Aimée. The Morozko (1964 film) was based on the fairy tale. Once there was a woman who had both a daughter of her own, whom she loved, and a step-daughter, whom she hated. One day, the woman ordered her husband to take her stepdaughter out into the winter fields and leave her there to die, and he obeys. Morozko finds her there; she is polite and kind to him, so he gives her a chest full of beautiful things and fine garments. After a while, her stepmother sends her father to bring back the girl's body to be buried, which he also obeys. After a while, the family dog says that the girl is coming back, and that she is beautiful and happy. When the stepmother sees what her stepdaughter has brought back, she orders her husband to take her own daughter out into the fields. Unlike before, this child is rude to Morozko, and he freezes her to death. When her husband goes out to bring her back, the family dog says the child will be buried. When the father brings back the body, the old woman weeps. In the Grimm version, the girl is coated with gold and sliver coins while the rude child is coated with cement, mud, flour and pitch. ^ Andrew Lang, The Yellow Fairy Book,"The Story of King Frost"
This page was last edited on 7 August 2018, at 21:43 (UTC).